I was honored to be a speaker at BlogHer ’12 in New York a couple weeks ago. I was asked to lead two 30-minute grammar clinics in The Writing Lab. 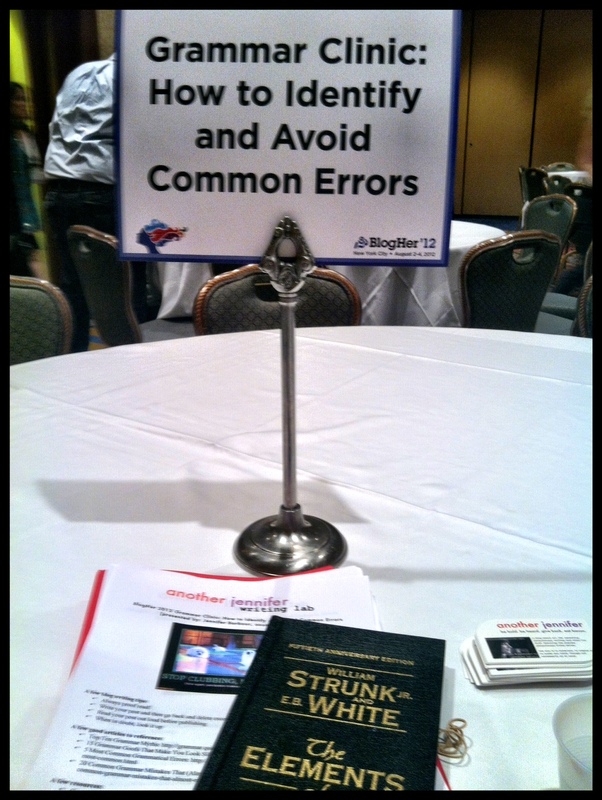 The topic was How to Identify and Avoid Common Errors. I promised that I would write about our conversations, and as I go through my notes, I think I may end up writing a series of posts. I will get into some details on common mistakes and resources later. First, I’ll start with the basic tips I shared with the participants in my clinic. These are the steps that I take to help me identify and avoid common grammatical errors. Always proof read! This tip may seem like a no-brainer, but there are a lot of bloggers out there who just don’t take the time to proof read their posts before publishing. We discussed this in my sessions. Part of the problem is lack of time. Sometimes, other duties call, like sleep or kids, and you just have to publish and get it over with. It’s worth it to spend a few moments and double check that you didn’t make any silly spelling or punctuation errors. I shared that I usually write my posts at night and schedule them to publish early in the morning. If I’m too tired to proof read at night, I just make sure I read the post first thing in the morning when I wake up, and I edit any mistake, if needed. I’ll usually catch mistakes before the post is emailed to subscribers and before I share it on social media. Write your post and then go back and delete excess words and punctuation. I say this as a trained copywriter. In copywriting, you want to keep things short and simple. You need to say what you need to say, give the reader a call to action and be done with it. I was taught to write first and cut the excess later. I’ll write posts, get everything out of my brain and then determine what just doesn’t need to be there. As I write this, there is an entire paragraph in the beginning that I’m pretty sure will be deleted before I publish. I’ll cut excess words, sentences, and even paragraphs, if they don’t serve a purpose in the post. And I mention excess punctuation because I find many people go a little nuts with commas and ellipses. It can be tough for bloggers to edit, but it helps create tighter writing. Read your post out loud before publishing. This trick is so easy and helpful. Read your post out loud. Does it make sense? What sentence or words are you getting stuck on? Delete and re-write the words that just don’t flow out of your mouth. Sometimes, it’s easier to get rid of the stuff that just doesn’t sound good and write it again another way. Ask yourself, what am I trying to say here? This technique is also a great way to pick up typos that you might auto-correct in your head when you’re not reading out loud. When in doubt, look it up. I’ll admit it. I look up grammar rules all the time. When I blog, I am constantly fact checking or making sure that I’m using a word or phrase correctly. I noted in the sessions that we all have one or two grammar issues that get us. For example, I can never remember how to properly use lay or lie. Know what you don’t know. Then, look it up! How do you identify and avoid common grammatical errors? If you’re interested in checking out some of the liveblogs from BlogHer ’12, you can visit BlogHer ’12 VirtualCon. I believe they are still loading all the resources and photos, but there are lots of good notes from the panels on the site. “Read your post out loud” is the most rocking blog writing tip you could have given me. Ironically, I teach fiction writing and tell my students to do this, but apparently, I had a total disconnect in following my own advice when it came to my blog. Great reminder and thank you! You’re welcome, Ilene. It’s nice to be reminded every now and then. I often have to remember to follow the advice I give to clients! I’m so glad you did this post Jennifer. Any advice that can enhance my writing or my blog is appreciated. Honestly it can be rather intimidating with so many bloggers out there who are professional writers and college graduates and then there’s “me”….the high school grad who never cracked a book except my kids books during homework time. But like everyone else I’d rather not make those mistakes if possible. Sometimes I print out my post and sit down with a pencil and edit that way. But honestly only if it’s an important piece like a guest post or something particularly meaningful. With my regular posts I tend to read them over and over cutting and fixing. And even then I always have this feeling I’m missing something. Rather like going on vacation and thinking you left the door to the house unlocked. Affect/effect. I have to look it up and say it out loud every time. The trick I was taught with that one: affect is A verb. So if I can use it as a verb in the sentence, it’s affect, with an a. Unless, of course, you’re talking about psychology, but that’s a whole other issue. And most people don’t use that term anyway. I am one who spent her entire life Journaling, that is until approximately two years ago when I actually connected on a free on line service. I was so hooked, although I still like to handwrite as well as feel a great bind journal designer’s varied kinds, ie: leater, cloth, varied colors, etc. However, the social combined with just blogging has given me a way to connect with others and still keep my identiy private which thrills me to no end. Recently I have taken several courses on Creative Writing and I must say meeting other persons as myself, new-be out of the closet writer has been fasinating, plus meeting and hearing the wide range of talented form styles of writing and talents out there, including social contacts. Thanks, Caroline. I think there’s always room to learn more. And I’ve found that to become a better writer or blogger, you just have to write more! Wonderful post and I never thought about reading them out loud but after this article I will. Thanks for some helpful hints I am sure we can all use. Reading out loud is another tip I developed from my experience as a copywriter. Even with proof readers, mistakes come up, and you end up finding them after something is printed! Reading out loud helps me find the things I’m auto-correcting in my brain. I find that, when in doubt, I fire up Google. But, even after a few proof reads, I still see errors. There are great tips. I hope we see some more! I can always find errors in my writing. We’re also our worst critics! I’m planning on a resources post right now. Stay tuned. Thank you for the great post and the link. I too, look up the rules. Writing is becoming more loose, but not the rules. I love to have students read their material out loud. I also like the look of your website and will be back to explore when I have more time. Thanks, Sheila. I’m glad you found the post helpful! Hello – coming over from SITS. Love this post! My sister and I always say that we think we were absent the day they taught grammar in school. I’m trying to make up for it now though: I have a copy of my father’s grammar text book from the 1950s and I’m not afraid to use it! It’s always good to have a reference! Thanks for stopping by. Great tips and reminders! I try to proof read all of my posts before publishing. Unfortunately, a few always get missed and I scramble to fix them before anyone else notices. I’m kind of a grammar freak even though I’m certain I need a few refresher courses. Now, does it make me a bit of a snob if I admit I stop reading any blog with too many errors? I have no patience or interest in any blog that cannot be bothered with proof reading before hitting publish. A few typos is one thing but multiple errors that are beyond the typical typo is another. Oh, Kim, I don’t doubt there are a few extra commas in this post. As you said, nobody’s perfect. The funny thing I find with commas is that many people disagree on the “proper” way to use them. I’m also a bit of a snob when it comes to a blog post with too many errors. I’ll stop reading as well. There’s a difference between missing an error and just being sloppy, in my opinion. These are great tips.I’m sure I have extra commas and words all over the place. I find it hard to edit out words, or opening lines, although I do often take out paragraphs if they feel unnecessary to the over all piece. Commas can get confusing! Plus, people have differing opinions on their use. I hope this post was helpful to you!